Adverse climate impacts are already evident across Southern Africa and pose a serious threat to the development prospects of the region's societies. Sustainable development in this region will depend on the rapid development and implementation of effective adaptation measures. This volume identifies the new socioeconomic and political boundaries to development that result from ongoing climate change in Southern Africa. The collected papers explore the region's potential for a transition to development strategies that combine meaningful socioeconomic investment and adaptation measures while also improving livelihoods in the region. 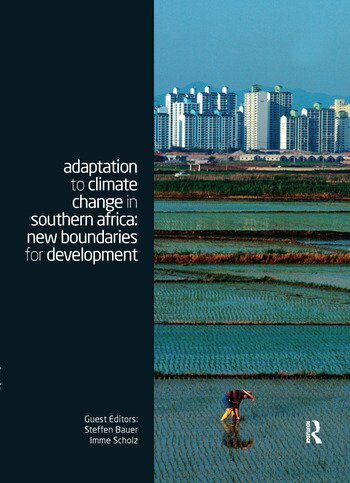 The chapters are backed up by detailed case studies which underscore the urgent need for national governments and multilateral agencies to develop strategies to support Southern Africa's societies in adapting to climate change. Steffen Bauer is a Senior Researcher in the Department for Environmental Policy and Management of Natural Resources at the German Development Institute, Bonn, Germany. Imme Scholz is Deputy Director of the German Development Institute in Bonn, Germany, and Head of its Department for Environmental Policy and Management of Natural Resources.